We’re bored with our couch, too. Granted, it’s only been a year but it’s not the one we really wanted. Originally, we bought a tan one that was 100″ long. When we went to sign our lease, we were told that the regular elevator was what they considered to be the “freight elevator”. 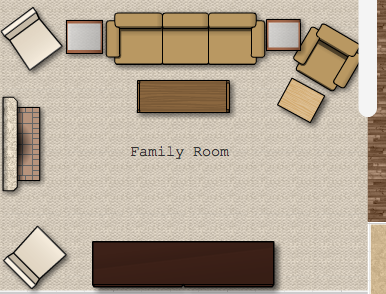 We had to go back to Ashley Furniture (the HomeStore one) and switch to the couch we have now. Whenever we get a new couch, we want a bolder color like a yellow or orange. No more playing it safe for us! 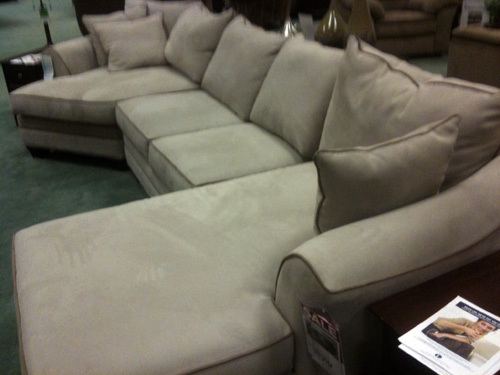 Check out the Brand ROWE, We were in love with a pottery barn sectional but the $$$ got me every time. Well then I wondered in to my local furniture store and was able to cutomize just what I wanted (except no slip cover) which made it way cheaper. We were able to spend 1/3 of what we would have at pottery barn and we got the fabric protection. And let me tell you between 2 adults a teenager, a two year old and a dog it is looking great! And super comfortable. Love the color of your living room. We are looking at sectionals also with no luck. 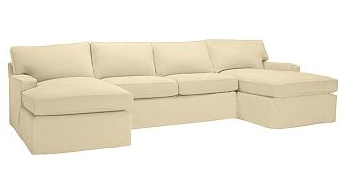 I live in Georgia, so am not familiar with the store you found the dark piping, but comfy sofa. I don’t think the piping would not be as noticeable in the room. We have a green sofa with tan piping and I honestly don’t notice the color difference there. Good luck. How is Darwin? I lost my 14-year-old kitty to organ failure about a month ago and during my sadness, stumbled on your blog while surfing the web. My cat’s name was Zen and she was so affectionate, that even people that didn’t like cats fell in love with her. Good luck with the kitty and enjoy the great sofa hunt. Thanks Susan! 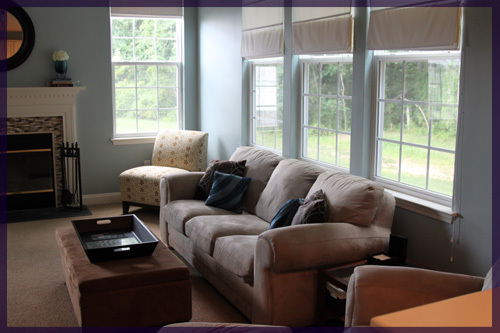 The family room wall color is Benjamin Moore’s Wedgewood Gray. Thanks for asking about Darwin, he hasn’t been responding to his treatments 🙁 He’s doing okay to us- still eating, playing a little and currently snuggled up with me, but his little body is reaching his limit. We’re taking life one day at a time.